KINTYRE: Torrisdale Castle Estate today; best for views was a male Hen Harrier, a Cuckoo and a Great Spotted Woodpecker. Singing birds included 3 Tree Pipit, 2 male Common Redstart, 4 Spotted Flycatcher, a Pied Flycatcher, 7 Blackcap, 2 Wood Warbler, 5 Chiffchaff and a Bullfinch. 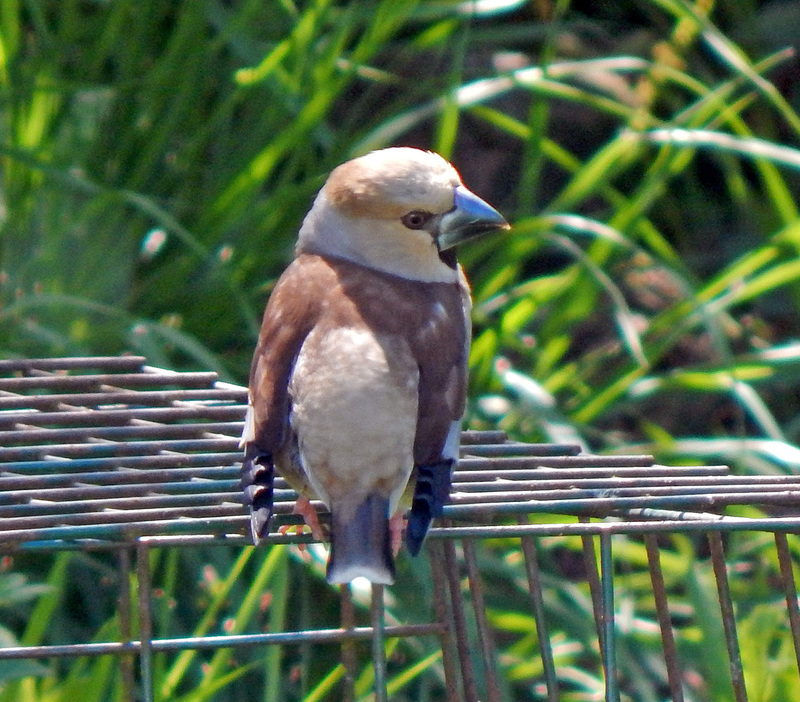 A Jay flew over our heads calling (Eddie Maguire and group). MID-ARGYLL: 10 Canada Geese with 6 Goslings at Ulva Lagoons and another 3 Canada with 10 Goslings on the marshes nearer Loch na Cille. We saw 24 Greylags in several groups in the area, but no Goslings yet (Morag Rea). 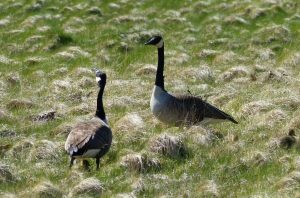 At the Add Estuary – 2 lots Canada Geese with first goslings noted on 7th May. In the garden at Cairbaan today a single Garden Warbler and nearby a reeling Grasshopper Warbler and singing Common Whitethroat (Jim Dickson). MULL: A report of a Great White Egret yesterday at Dervaig – more details required please. 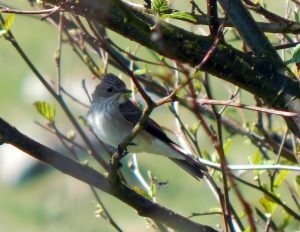 TIREE: 2 female Hawfinch at Balephuil and the first Spotted Flycatcher of the spring there (John Bowler). 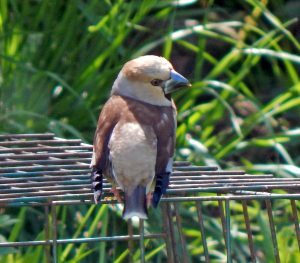 HAWFINCH – Balephuil, Tiree 13th May (John Bowler). 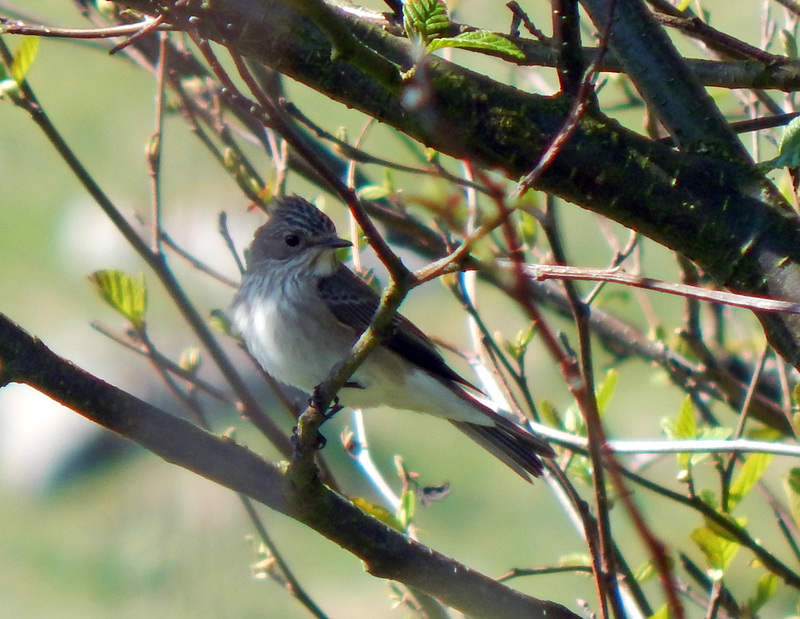 SPOTTED FLYCATCHER – Balephuil, Tiree 13th May (John Bowler). CANADA GEESE – Ulva Lagoons, Mid-Argyll 13th May (Morag Rea).